Sometimes even the most pretentious artists or religious fountain pen users have to use a ballpoint pen. Now they could just use a ballpoint insert in a more expensive pen, but they might not want to do that. They also might not want to use a Bic ballpoint. So now we enter the level of not entirely expensive or cheap ballpoint pens. The first being the Zebra F-301 ballpoint pen. 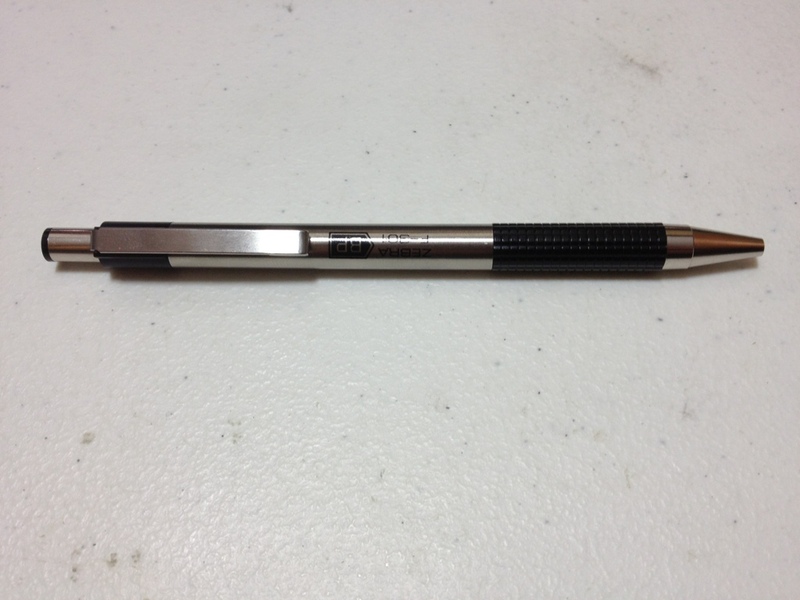 The pen is made of stainless steel with a round barrel with the model number on it. The (grip) section is a checkered plastic that is grippy and between comfortable and uncomfortable. It really does nothing for me. The cone near the tip is nothing spectacular. The clips is a simple stainless steel, with a plastic back and a metal button. The button does not lock down when depressed so it does shake when one is writing. Otherwise, the body is very study and light. Denting is hard; scratching is fairly easy, though. The point is very fine. It writes smoothly and the ink is standard ballpoint black. It is slightly grey and skippy unless one pushes down hard. It is not waterproof, but it doesn’t smudge after drying. I will say that the pen I have used is more prone to globs of ink off the tip than almost any other pen I’ve used. So overall the additional expense of this pen (which isn’t very much, but still…) over a regular ballpoint is obviously its design. 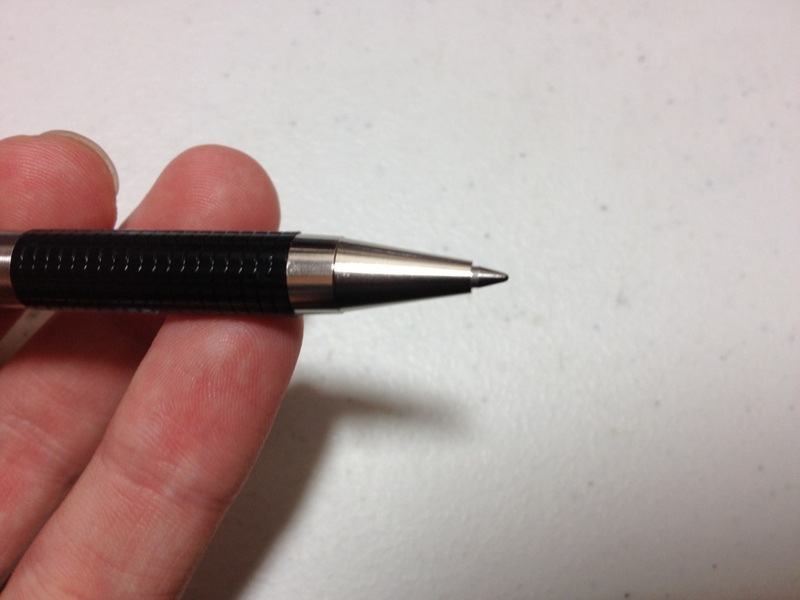 It will hold up better and is much more pleasant to hold than any other cheap ballpoint. The writing experience is about the same, which, to be fair, doesn’t get much better with the more expensive pens. It really is just a matter of taste and how much you want to spend on this one. This entry was posted in Beginner Supplies, Utensils and tagged ballpoint, ballpoint pen, pen, pens, review, stainless steel, zebra, zebra pen by Dragon Co (Austin Smith). Bookmark the permalink.